Over the past few years, I’ve been working to reduce the number of skin- and personal-care products I use on a daily basis, and transitioning to natural products whenever possible. It’s been hit-or-miss on occasion, but with a little trial and error I have been able to find quality alternatives that meet my needs. I know…summer is over. So, why are we talking about sun care in September? Well, the Earth is actually closest to the sun in winter—especially during the winter solstice—and the sun’s rays cover a larger area. Winter may be gloomy at times, but it’s still necessary to protect ourselves from those UV rays. If you live in sunnier areas, such as Hawaii, Arizona or Colorado, sun protection is a year-round need! AVEENO has been part of the natural health and beauty industry since its beginning in 1945. Today, they’re known for their use of high-quality, natural ingredients and have even added the tagline “Active Naturals” to their branding. Although this sounds amazing—and is for the most part—their sun care products are anything but all-natural. 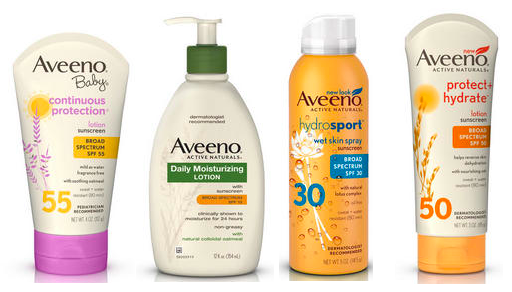 AVEENO offers several SPF-enhanced lotions and moisturizers, along with actual sunscreen, ranging from SPF 15-50+, including products for babies. The Environmental Working Group’s (EWG) Skin Deep database rates the majority of AVEENO’s sun care products a moderate hazard (3-5) to human health. However, looking more closely at the ingredients that comprise these items, it becomes clear that most include one or more high hazard (7-10) ingredients. Photo courtesy The Binder Ladies. Parabens: A number of parabens are present throughout AVEENO’s sun care line—propylparaben, butylparaben and isobutylparaben—all of which are ranked 7 out 10 by the EWG. Often used as preservatives in a variety of personal care products, parabens have been linked to hormone and endocrine disruption because they mimic estrogen in the body. These disruptions may lead to a number of health concerns, such as developmental problems in children and certain types of breast cancer. Oxybenzone: A common ingredient in sunscreens, oxybenzone acts as a UV absorber or filter. It has been ranked by the EWG with a hazard level of 8. Most often the hazards associated with this compound are allergic reactions and bioaccumulation, due to how well the skin absorbs it, but it is also a known endocrine disruptor. Benzyl Alcohol: Although this ingredient occurs naturally (rated a 5), it can have a drying effect on skin and may cause contact dermatitis. Protecting our skin from sun damage is essential to avoid premature aging, sun spots and skin cancers. But when it comes to choosing safe sun care products, be sure to read ingredients carefully before making your purchase. As we become a more health-conscious society, limiting the number of toxins in our homes has become a larger priority. Personal care routines shouldn’t be an exception, even though simplifying these routines isn’t always easy—trust me, I know—it’s well worth it in the end.